Photos of this particular rustic country kitchen by Leanne Ford for the Frerotte family are BLOWING UP on PINTEREST so if you are hoping to attract followers or gain any sort of Pinterest traction, do PIN AWAY today! Why are design fans and viewers of Restored by the Fords loving Ford’s FRESH FARMHOUSE approach? It feels young and not like your granny’s farmhouse. Edgy rock and roll decor elements, Mid-century Modern chic finds, and quirky art with a sense of humor are layered in the mix. She is a breath of fresh farmhouse air because she is bold enough to HAVE FUN! Remember fun? Designed by Leanne Ford, the Frerotte’s white kitchen with its rugged and natural decor elements is attracting tons of attention for good reason. It feels authentic, organic, approachable, and lived in. It somehow embodies something fresh on the modern country horizon: LUXURIOUS MINIMAL or LUXURIOUS FARMHOUSE. Really? Really. Before we get into one more delicious decor detail, WE HAVE TO start with a source for a similar Sputnik chandelier very reminiscent (less lights on this one – and remember, you can opt for clear bulbs if you like. 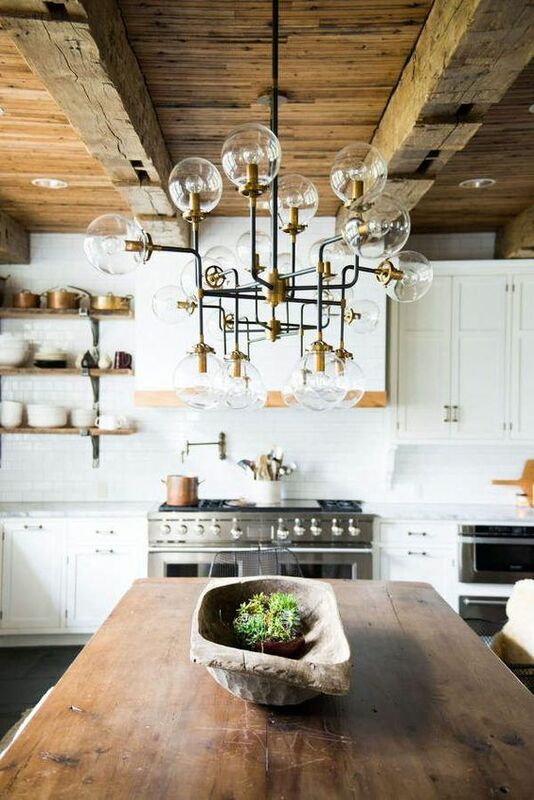 :)) of the one in this modern farmhouse kitchen with Mid-century modern style and rustic decor by Leanne Ford. Notice how Leanne Ford boldly uses her signature white with the kitchen cabinets here, white window trim, white marble, and white subway tile. Is anyone calling the design police because she didn’t contrast the cabinets and counters? There is something so heartwarming about a vintage style kitchen missing the giant modern day marble topped island, isn’t there? Leanne Ford has moved in a great big farm table, and it would appear there is not even enough room for chairs on both sides of this table. That’s more than a bit refreshing for me since I have the same issue in my wee kitchen dining area. This designer loves her some sheepy fuzzy wuzzy, and you’ll see sheepskin show up in a ton of her designs. They add femininity, warmth, and softness and are quite functional as well. Unless my eyes are failing me, the designer even took it to the ceiling on the dramatic yet simple range hood which is trimmed with knotty, natural wood. Go big or go home? I love taking tile all the way up the wall when possible for drama and ease. If you have the room and the plumbing potential in your kitchen design, why not!?! My friend Tina (Enchanted Home) has a similar arrangement in her kitchen with a completely different design style. I have the same bias when it comes to windows. If I can get away with no covering at all, I’m a happy camper. Curtains or blinds would change the look of this rustic modern farmhouse kitchen significantly, and who doesn’t appreciate all that light!?! In my next house build I am doing the kitchen with a big table right in the middle of the room with no island. Nice to see this example. I am also doing a big back kitchen/pantry so don’t need the storage from an island. No curtains and no uppers. Paintings on the walls instead. Love me some Leanne Ford. Looks like she is going to be in another TV series with other decorators coming soon. I love leaving windows bare where possible. The sunlight and gardens are nature’s gifts to be enjoyed not shut out. Beautiful kitchen, Michele.